"S" and "S+" parts, simply stand for 6GB RAM 128GB storage and 6GB RAM, 256GB storage, respectively. New Maroccan Blue and New Platinum Gray. Those will be the only two launch options for the V30S and V30S+. ThinQ is LG's new AI there is AI CAM - a layer of artificial intelligence on top of the camera viewfinder that is designed to recognize the subject of the shot and adjust the camera settings accordingly. Currently, it can sort things into 8 categories: Portrait (Person), Animal, City/Building, Flower, Sunrise, Sunset, Food and Landscape. Nifty, even if not really that innovative. Then there is QLens, which can attempt to recognize specific objects for the purposes of shopping, price and image searching online. It can also read QR codes - a lot less impressive, but still very practical. Last, but not least, ThinkQ can communicate with all your existing and future IoT, smart appliances, like washing machines and dryers. LG is also attempting to keep ThinkQ and its AI efforts as open and accessible as possible. Google Assistant integration fits in pretty well with that ideology. You should be able to ask ThinkQ to take photos and search for things, or pull up IoT device info straight through Google's AI voice or text. 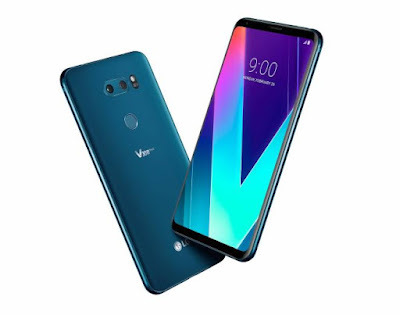 LG V30S ThinQ will be on sale first in Korea within a couple of weeks. After that, it will be made more widely available later in March. No word on price yet.